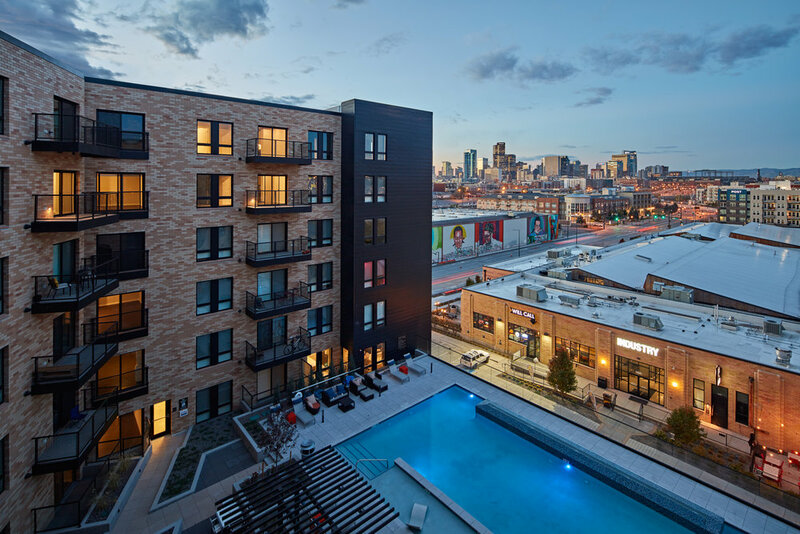 Denver’s Charging RiNo Neighborhood: Designing Edison at RiNo — Valerio Dewalt Train Associates, Inc.
River North’s newest residential complex, takes cues from RiNo’s industrial past. Once an industrial hub, Denver’s River North neighborhood (aka RiNo) has undergone a radical transformation over the past couple of decades. As industrial uses waned and warehouses emptied, artists and tech startups began moving in, followed by cafés, brew pubs, and music venues. Artists banded together to create the RiNo Arts District in 2005, and within that, helped create a business improvement district and a general improvement district to raise funds for improvements. The city also invested in the neighborhood’s future with a major infrastructure improvement project, turning two-lane Brighton Boulevard into a four-lane street with traffic signals, sidewalks, and raised bike lanes. The success of the transformation so far is evident in the numerous construction projects underway throughout the neighborhood as historic buildings are repurposed for office, residential, and retail uses, complemented by new construction. 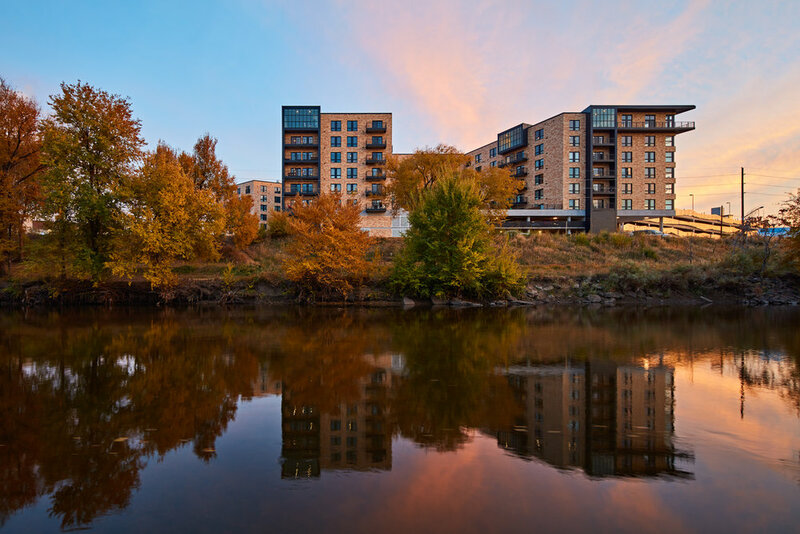 Recently, Valerio Dewalt Train added to this transformation, completing our first project in Denver—Edison at Rino, a new 277-unit residential building. It all began when a local businessman decided to adapt a 1939 brick produce warehouse into a creative-tech coworking office community, dubbed Industry Denver. Texas-based Kairoi Residential invested in the project and also purchased an adjacent parcel with the goal of building multifamily housing that would appeal to the kinds of young tech workers at Industry. Kairoi had already worked with us at EnV, their multifamily tower in Chicago (coincidentally, that one is in Chicago’s River North neighborhood, also a formerly industrial area…) and they brought us in to help with the master plan for the site and then design the building. We wanted Edison at Rino to complement the formerly industrial neighborhood, so we developed a contemporary spin on the warehouse vernacular of the Industry building, incorporating bricks of the same size and color, along with metal and concrete accents. VDT deployed pairs of vertical bands of metal panels that project five feet from each façade, helping break down the visual mass of the nine-story building. The bands also help integrate the upper residential floors with the base of the building—turning horizontal and enclosing additional volume for the top-floor units, with areas of floor-to-ceiling glazing to celebrate views of the mountains and the downtown. The building’s apartments range from studios to one- and two-bedroom units. Roughly speaking, we laid the building out with intersecting wings, which allowed us to create three enclosed, outdoor areas for the residents. This configuration gave us the best options for capturing views from the property. One courtyard has an infinity pool and downtown views; the second an outdoor kitchen with mountain views; and the third smaller in scale, a contemplative and more private space. Other amenities include a health club facility, a community clubroom, a resident lounge, a bike storage and repair room, electric car charging stations, and a parking garage. Another unusual aspect to the project was the use of cutting-edge prefabrication techniques developed by Prescient, a building technology company. Prescient created what is essentially a load-bearing metal stud wall system that allows a project to be built much more quickly and economically than, say, a cast-in-place concrete structure. Ironically, although Prescient is based in Denver, the system had difficulty getting approved by the City of Denver. VDT spent time familiarizing the city’s building department with the system until they were comfortable enough to approve its use, allowing not only our project to go forward but also others throughout the city. With Prescient, construction moved at an unusually fast pace: 5,000 square feet per week. But considering the artistic roots of the district, we didn’t limit our innovative thinking to just manufacturing. For example, street art is big in RiNo. A number of businesses and organizations in the area have commissioned murals, and graffiti artists are always contributing their own artworks. There’s even an annual mural event called the Colorado Crush Street Art Festival, which results in dozens of murals each September. To build on this great creative energy, the owner of Edison at Rino is looking to engage local artists to enliven portions of the building with public art. We love that our first project in Denver is in this burgeoning, eclectic, dynamic neighborhood. It was a great experience to build on the gritty authenticity of the area’s glorious old structures and capitalize on what makes it special. Now we like to joke that we’re looking for our next project in a city with a neighborhood named River North. San Antonio?